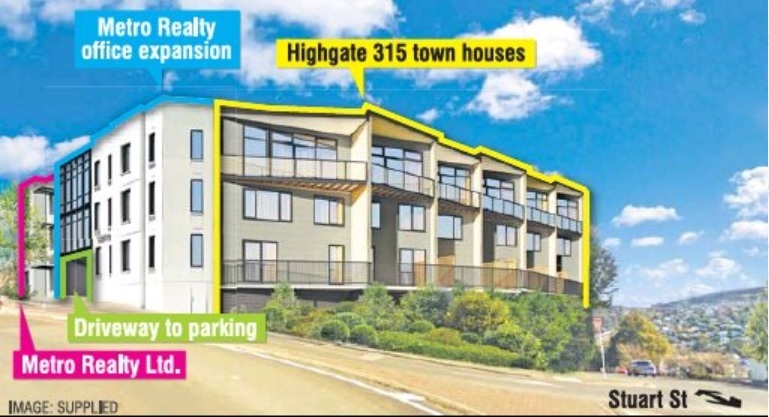 Roslyn's skyline is about to be transformed as construction of a multimillion-dollar three-storey town house complex begins in the Dunedin hill suburb. The former KFC and Roosters restaurant site on the corner of Highgate and Stuart St was demolished recently, and site owner and Metro Realty Ltd managing partner Mark Stevens said it would be developed as part of an expansion of the Metro offices in Highgate. "The reason we're doing it is because we need offices and we want to stay where we are. The byproduct is that spare land at the back." The spare land would be called Highgate 315 and would contain six freehold town houses, each covering about 150sqm-190sqm. Each would also contain a two-car garage, a lift, three bedrooms and two bathrooms, kitchen, dining and living areas with "spectacular views of the harbour over the Roslyn bridge", he said. Mr Stevens planned to live in one of the town houses. He would keep two others, and the remaining three would be put on the market for more than $800,000 each. "The builders have started on the foundations and it's good to finally see them on site." He hoped construction would be complete before the end of next year. Mr Stevens also owns the former Roslyn post office building across the street, where Metro has operated for the past 27 years. More recently, it created another office directly across the street, to house more staff. The company continued to grow and part of the new Highgate 315 development would contain offices for Metro staff. Once the development was complete, the post office building would receive about $250,000 worth of refurbishments before being leased.